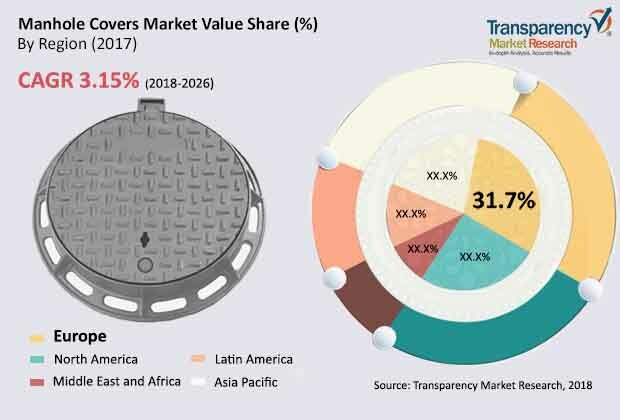 According to Transparency Market Research, the global manhole covers market is anticipated to reach a valuation of US$4.8 bn by the end of 2026. In 2017, the market earned US$3.65 bn. if the global manhole covers market rises at 3.15% CAGR between 2018 and 2026, it might attain this revenue. Depending on types of products, the composite covers segment is expected to lead the global manhole covers market in the forthcoming years. Owing to the fact that composite covers are lightweight and provide high strength to composite covers led demand in of this segment. In addition, zero scrap value of these covers reduces chances of theft of these covers as compared to metal covers that are often stolen. With respect to geography, Europe is likely to hold leading share in the market. However, developing regions in Asia Pacific are expected to give a tough competition in the growth of this market. Rising economic development that led in significant rise in developing various end-users has increased growth opportunity of Asia Pacific region. The demand for manhole covers is rising mainly because of increasing economic development in developing regions. As various economies are working towards advanced infrastructural setup, and is spending heavily in the construction sector they are likely to fuel growth in the global manhole covers market. Growing population in both developed and developing countries that has led demand in the real-estate industry has also increased demand for manhole covers. Moreover, increasing initiatives taken by government to strengthen the civic system especially in developing regions in Asia Pacific will further augment demand in the global manhole covers market. Adding further, innovations have introduced new eco-friendly products with the reduced weight of manhole covers. Developments and technological innovations are also expected to introduce of newer materials for the manufacturing of manhole covers. These factors will also fuel demand in the global manhole covers market. On the contrary, to the above-mentioned growth factors, few restraints might obstruct growth in the global manhole covers market. Occupational injuries caused during repairing or installation of these covers is one of the major restraining factor. In addition, metal covers are easily stolen and sold at higher price, which also negatively affects growth in the global manhole covers market. These factors are likely to be reduced with composite manhole covers, as they have zero scrap value and high strength-to-weight ratio. Therefore, the past couple of years, the demand for composite manhole covers is expected to increase that might also reduce the above-mentioned restraints. The study presented here is based on a report by Transparency Market Research (TMR) titled “Manhole Covers Market (Product - Metal Covers (Cast Iron, Ductile Iron, Steel), Concrete Covers (Conventional Concrete, Steel Fiber Reinforced Concrete), Composite Covers (FRP/GRP and Others); Application - Municipal, Industrial Facilities, Commercial Facilities, Utility Pits) - Global Industry Analysis, Size, Share, Growth Trends, and Forecast 2018 - 2026”.